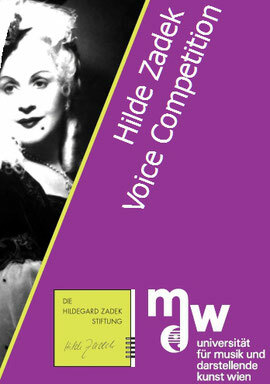 Held every two years, the "International Hilde Zadek Song Competition" promotes the development of gifted young performers while highlighting the special achievements of the great artist it is named for. Hilde Zadek’s story is an extraordinarly one - Born in what today is Poland, she fled growing anti-semitism; emigrating to Palestine in 1935 at age 17. That’s where the young maternity nurse realised her true calling – singing. Returning to Europe in 1947, she made her debut in Vienna as Aida, in front of an audience still tinged by the Nazi ideology that forced her to emigrate before the war. Some had whistles ready - but they stayed silent. Instead her performance was greeted by tumultuous applause and she celebrated her first on-stage triumph,. The Vienna State Opera would remain one of her main venues for the next 25 years. She was made an Honorary Member, belonged to the legendary post-war Mozart Ensemble and performed the great soprano rôles of the classic and romantic works as well as those of E.W. Korngold’s “Die tote Stadt”, Gottfried von Einem’s “Dantons Tod”, Franz Schmidt's “The Book with Seven Seals”, Alban Berg's “Altenberg Songs”, Gian-Carlo Menotti's “The Consul”, and music from Schönberg, Krenek and Webern. Her international career has taken her to the great opera houses of the world: New York, London, Rome, Munich and Paris, as well as at the Salzburg, Edinburgh and Glyndebourne Festivals. A passionate teacher of the voice, she directed the Voice Department at the Vienna Conservatory and continues to conduct Master Classes throughout the world.